Josh Barbanel at the Wall Street Journal took the results of our just released Elliman Report: The Manhattan Decade 2003-2012 and adjusted them for inflation – showing that housing prices are as affordable as they were in 2004. 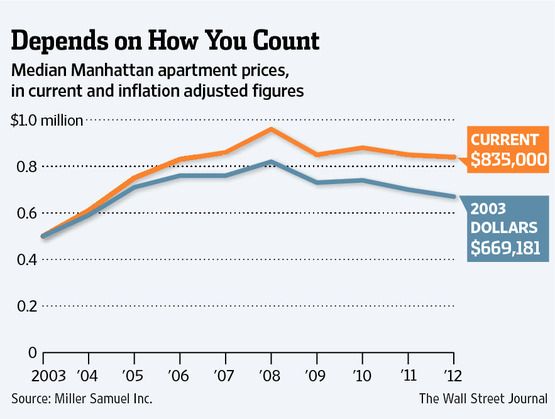 Here’s his original story in WSJ “Easing Apartment Pain” [subscription] that goes with the chart. 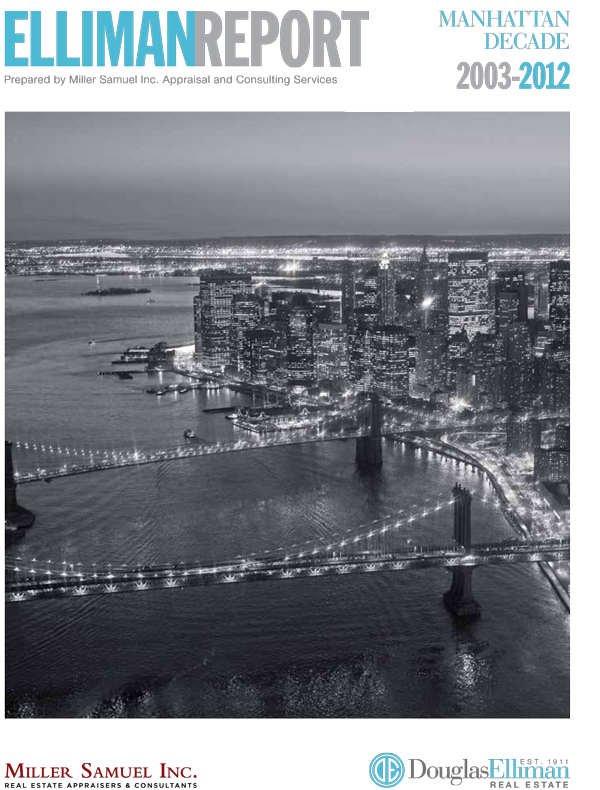 We published our Manhattan Decade report, a ten year moving window data compendium of the market from 2003-2012. It’s my favorite report just for the sheer volume of information that doesn’t exist anywhere else. I long ago dubbed it “The Phone Book.” This is part of an evolving market report series I’ve been writing for Douglas Elliman since 1994. Sales increased year-over-year for the 3rd consecutive year to second highest level in decade (after 2007 peak). Housing prices remain 11-13% below the 2008 peak, housing sales are 21.8% below 2007 peak. Housing prices were mixed but showed stability for 4th consecutive year after the 2008 credit crunch and correction. Listing inventory fell sharply to lowest level in 12 years. Credit remains tight as economy slowly improves. Inventory falling – low to negative equity, no urgency to list. Sales rising as record low mortgage rates create demand. Later today we’ll have additional information available on the market so you can build your own custom data tables and browse our chart library.